Gene began his real estate career in 1987 as a full time Realtor with Century 21 Jackson Real Estate and in 1990 became an office manager for another real estate firm. In 1994 he formed a new brokerage, Northern Tier Real Estate. As owner/broker of Northern Tier Real Estate Gene also obtained his Certification License as a PA Certified RE Appraiser. In 1997 he obtained a PA Auctioneering License. Gene provides competent and professional service to all of his clients and customers and ensures confidentiality in all real estate transactions. Gene has served as President of the Bradford/Sullivan Assoc of Realtors in both 2005 and in 2006 and numerous terms as a Director of the Association. In 2006 he was earned the “Realtor of the Year”award. Experienced, knowledgeable and professional!! Becky has lived in the Northern Tier her whole life. She has been self-employed since the age of 19 in a variety of businesses. She joined the team at Northern Tier Real Estate in 2007 as a full-time Realtor. Hard work and her willingness to go the extra mile has contributed to her success and she has many satisfied clients. If you are looking for your “first time home,” an investment property, new home, a farm or recreational property, Becky is here to help you find the home of your dreams and help you through the closing process!! Whether you are buying, selling or renting she is here to help! If you like a high energy and friendly Realtor – Becky should be your Realtor!! Although new in the real estate business since 2012 Tom has an abundance of knowledge when it comes to land, residential and business value! He is here to help you with all of your listing and buying needs. Always having been a Troy resident, he is familiar with the entire area with special emphasis on the Armenia Mountain area! Lori is a lifelong resident of Bradford County and is very familiar with the area and the local residents. She currently lives in Granville Summit and has three grown children and one granddaughter. A graduate of Troy Senior High School and Elmira Business Institute, she approaches every responsibility with attention to detail! Whether you are embarking on a new journey or putting down roots, Lori will apply her strong work ethic in helping her valued customers attain their goal of buying or selling property! Please contact her today to schedule an appointment. Ginny has lived in Bradford County al her life and she is very familiar with the area. 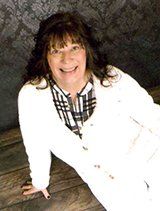 She is a graduate of Elmira Business Institute and Mansfield Real Estate School. She is vey knowledgeable about business and the needs of her clients. She is a hard worker and pays particular attention to detail. If you are looking to buy or sell she is here to help you. You can contact her today to schedule an appointment. Originally from Schuylkill County, PA, Dianne has a B.S. from East Stroudsburg University and a Master's degree from West Chester University. She has over 10 years of experience in the real estate profession throughout the area. Also has experience in teaching, coaching, and dairy farming, which includes doing 4-H projects. Loves horses and enjoys horseback riding. Contact her to put her experience to work to list your home, farm or land; or to help you in buying just the right one.